The first thing that hits you when stepping into the Khalifeh workshop is the heat. It comes radiating from a large makeshift oven made of bricks stacked on top of each other, in the middle of the room. Mahmoud Khalifeh, a second generation member of the family, takes a step back from the thick heat, blinking his eyes. ‘You do get used to it. But the summers are hard. It’s like being on the beach, only you don’t get tanned,’ Mahmoud says. He sits down on top of a wooden box, turned upside down on the floor next to the oven. One of his feet rests on a pedal that, once pressed down, opens the small door to the oven. 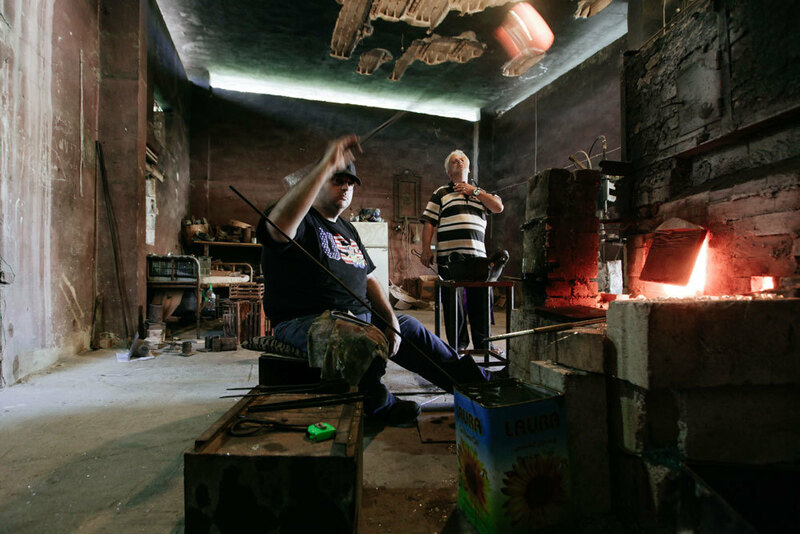 With his hand, he holds a long metal stick – a blowpipe, the most essential tool for an artisan glassblower. 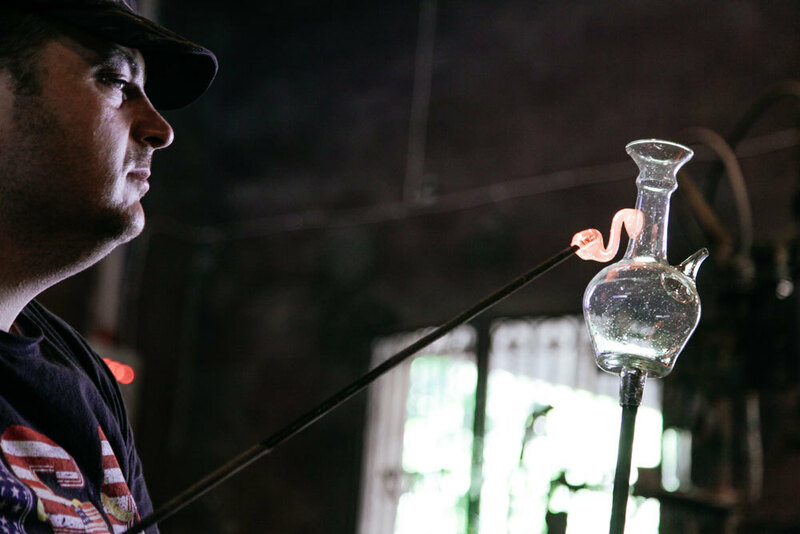 ‘Glassblowing is a family craft for us. I learned it from my father, who in turn learned it from his father,’ Mahmoud says. He opens the hatch slightly with his foot, then reaches to dip the blowpipe into what looks like a sea on fire – it’s liquid glass, melted at the temperature of 1,400 degrees Celsius. ‘I burn myself somehow every day. But I never went to the hospital!’ he says. The family just lit the oven a few days ago, which means that they currently work around the clock. 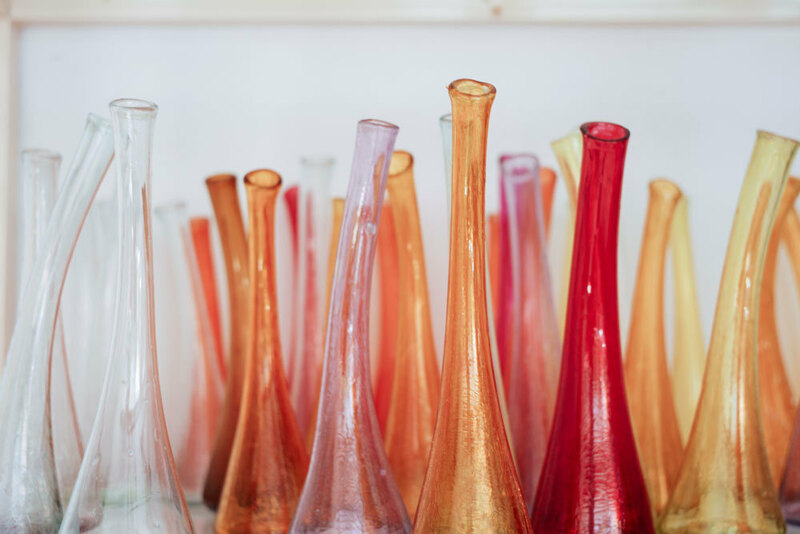 It’s expensive to keep the furnace burning – costing several hundred dollars per day – so they wait until they have several orders, and blow all glass at once. This time, they are making pitchers and glasses for a restaurant in Bahrain, and decorative kitchenware to be sold in small shops in Beirut. ‘Once we’ve started the oven we work in shifts. I work in the mornings, my dad in the afternoons and other relatives during the night,’ says Mahmoud. He takes out the blowpipe and grabs a blob of molten glass with its far end. 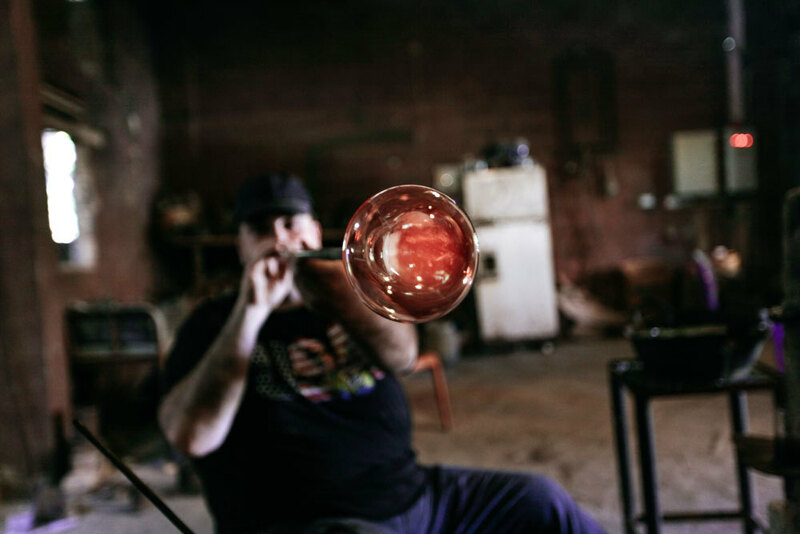 He lifts the stick to his mouth, then blows enough air through it for the glass to slowly take the form of a rounded shape. The whole process is done with ease – Mahmoud has blown countless glasses like this since starting with the craft as a teenager. The workshop, a simple building of brick and mortar, is tucked away at the far end of an alley just off the main road in Sarafand, a small coastal town in southern Lebanon. It was on this very coast, in 300 BC when the seafaring Phoenicians dominated the region, that glassblowing is said to have been invented. The craft quickly grew in popularity, and eventually appeared in all Phoenician cities. From there, it spread to Europe and, later on, the rest of the world. ‘We’re the only ones left in Lebanon today. 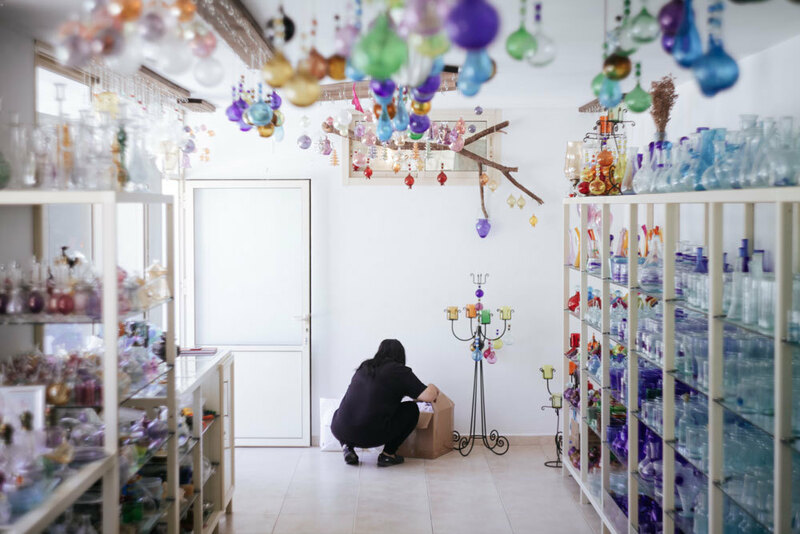 There used to be glassblowers in many parts of the country, but they no longer exist,’ says Ali Khalifeh, the uncle of Mahmoud and his partner at the morning shift. 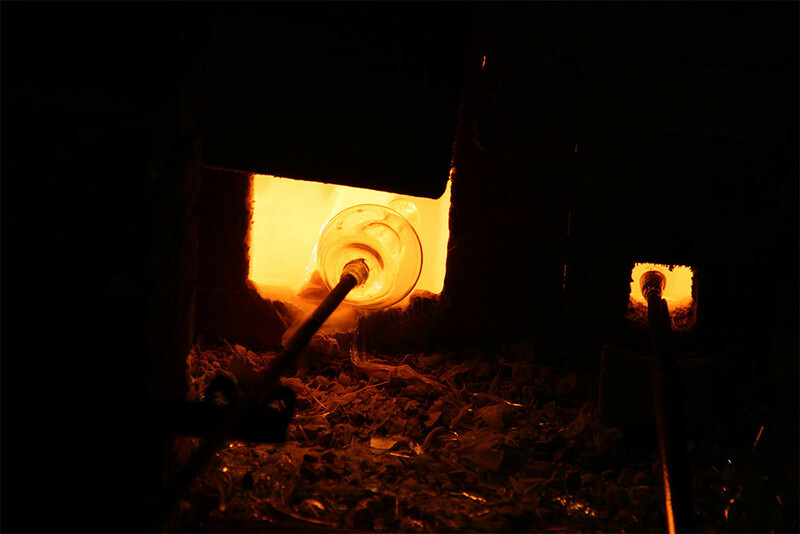 He waits for each piece of glass to be finished – it doesn’t take more than a few minutes, depending on its shape and decoration – then grabs it with metal pliers and places it inside the top of the oven, where the temperature is less than half of the furnace below. ‘The pieces have to cool down gradually, otherwise the glass will crack. They go through different stages, from 700 to 200 degrees, before we take them out,’ Mahmoud says. 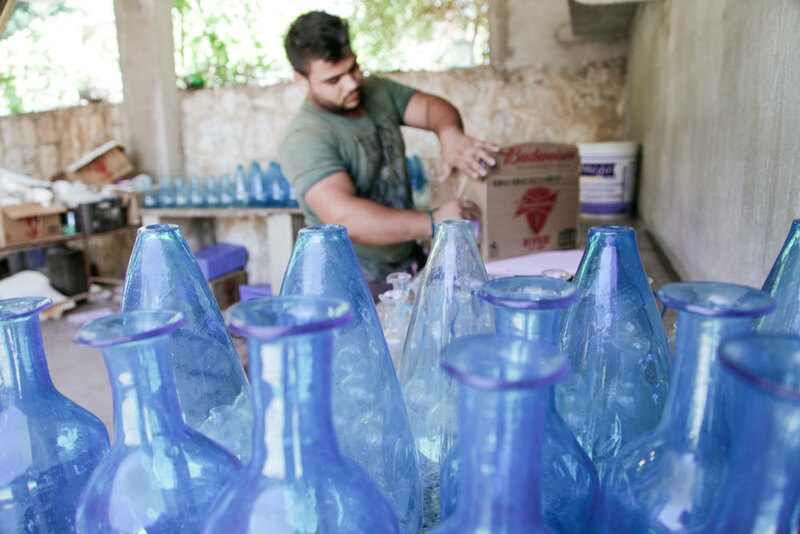 Again and again, Mahmoud collects new glass from inside the oven, repeating the same process. He works fast: as soon as the glass comes out and touches the air, it begins to harden. He often sticks the blowpipe back into the burning heat, to watch the glass soften a bit and become mouldable again. ‘Working with glass is like forming dough. You have to wait and observe and work with it until it’s ready,’ Mahmoud says. With a pair of metal tweezers, he forms an elegant handle on a transparent pitcher, common in Lebanese households for keeping fresh drinking water. It has a rounded shape and a simple, long neck. Most products the Khalifehs make are like this: plain, with traditional but refined designs. Only a few years back, the family fought hard to keep their business alive. When the highway to southern Lebanon was built in the early 2000s, cars stopped taking the old coastal road going through Sarafand and with them, many customers also disappeared. 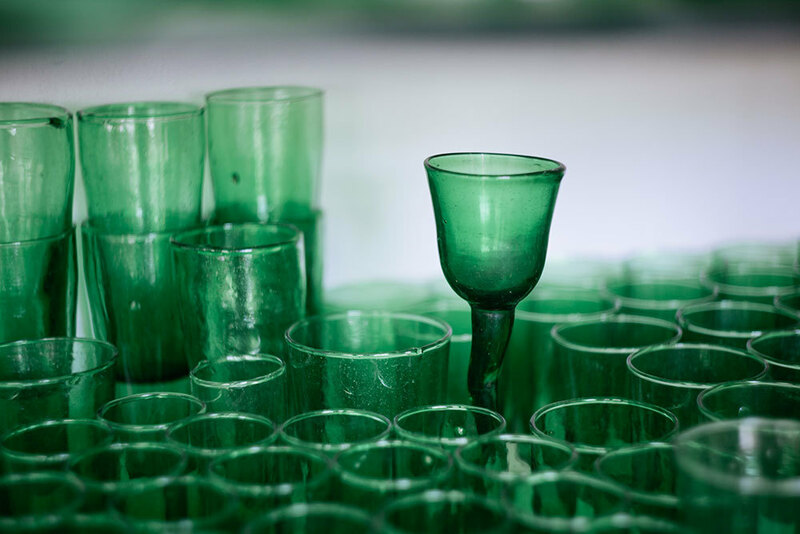 Since then, glass has seen something of a revival in Lebanon – mainly through an initiative by Ziad Abi Chaker, an environmentalist and entrepreneur in sustainable solutions. 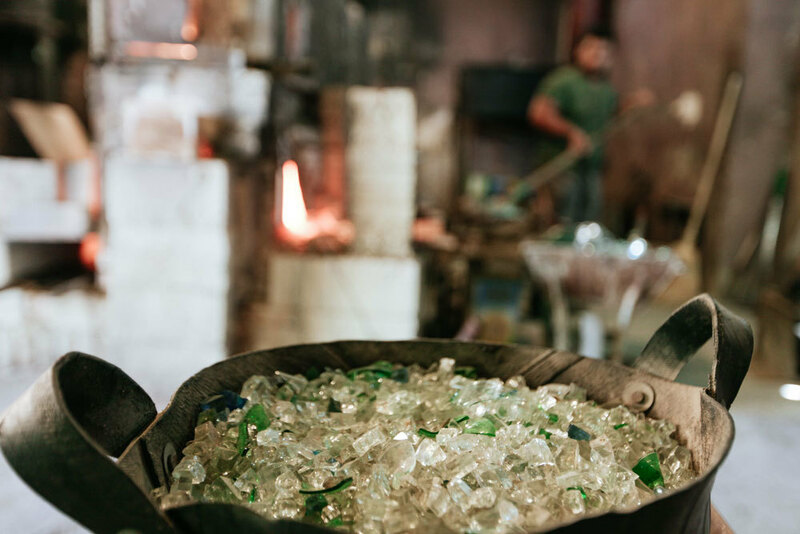 He has engaged the Khalifeh family in producing a line of contemporary products from recycled glass, using discarded green and amber bottles. Inside the small shop attached to the workshop are shelves full with tableware and decorative articles, all entirely made from glass, either free-blown or shaped in cement moulds. The little daughter of Mahmoud, Maza, comes out from behind the workshop, where the family’s home is. She picks up a broom and starts playing, sweeping up pieces of crushed glass from the floor. ‘She loves to be here, she usually stays in the workshop all day. Just like me when I was a kid. When she grows up, she will work in the family business as well – that’s for sure,’ says Nisrine Khalifeh, the sister of Mahmoud. Inside, the work of blowing shapeless blobs of glass into delicate creations continues. Piece after finished piece takes form on the blowpipe, then returns into the oven to slowly cool down. 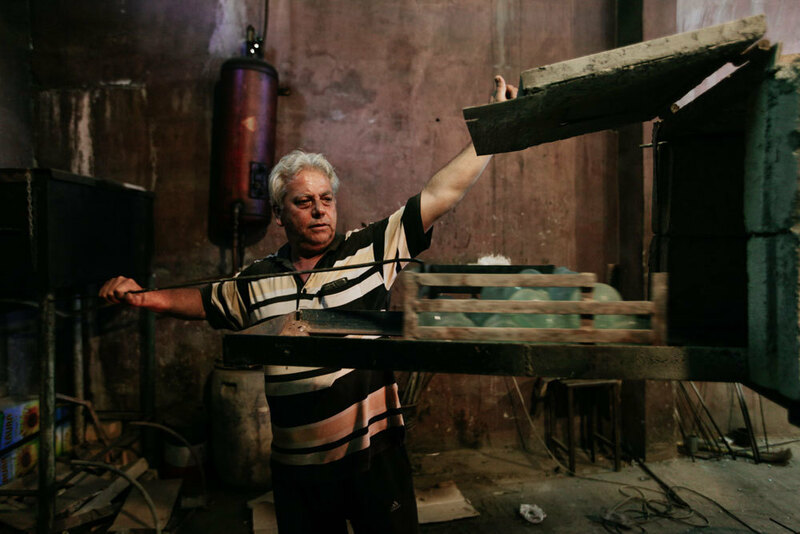 Abed Khalifeh, another artisan family member, opens another metal hatch, and starts shovelling pieces of crushed, discarded glass into the golden liquid inside. The circle of life inside Sarafand’s glassware workshop continues.